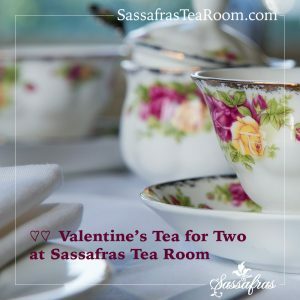 Spoil your BFF —parent, child, spouse, friend, sibling, or grandparent — with a delightful afternoon tea party at Sassafras Tea Room! Price is for two people, and includes tax and gratuity. Additional guests can be added… just ask us! Available all of Valentine’s Day week, from Monday, February 11-Saturday, February 16.